I believe that potatoes are some of the most comforting foods out there. 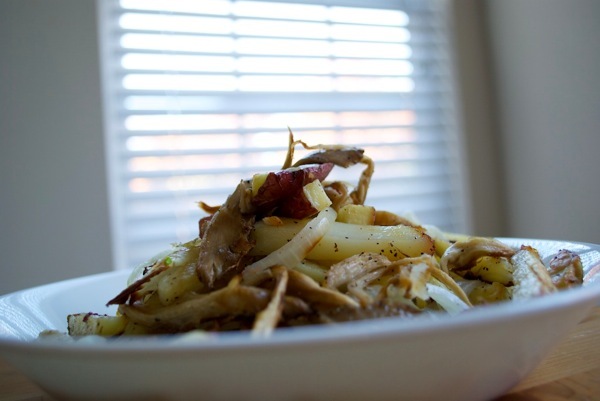 The soft mushiness of potatoes give warmth that can ward off even the dreariest days. These grown-in-dirt vegetables are often incorporated into hearty dishes such as chicken soups or are served solo as the venerable baked potato. Regardless, their simplistic, earthy qualities make potatoes so comforting. As a plus, potatoes are high in vitamin C, vitamin B6, copper, and manganese. However, potatoes often strike fear in dieters due to their high starch content. On occasion, even I may skimp over potatoes to opt for more complex whole-grain or whole-wheat carbohydrates, but that does not allow the discrediting of potatoes completely. They are healthy nonetheless, and remember, moderation is key! The featured potato recipe has a variety of textures from roasted potatoes, fried egg, and roasted mushrooms. Salt, pepper, and ketchup also combine to create a complimenting mix of savory flavors. Read more for a picture-by-picture, step-by-step guide on how to recreate the recipe! 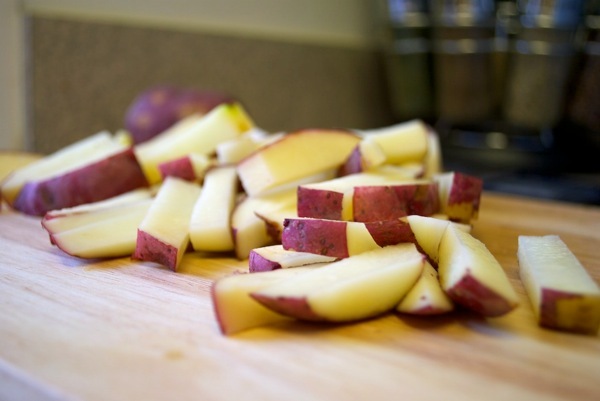 Slice four or five red potatoes into rectangular strips. 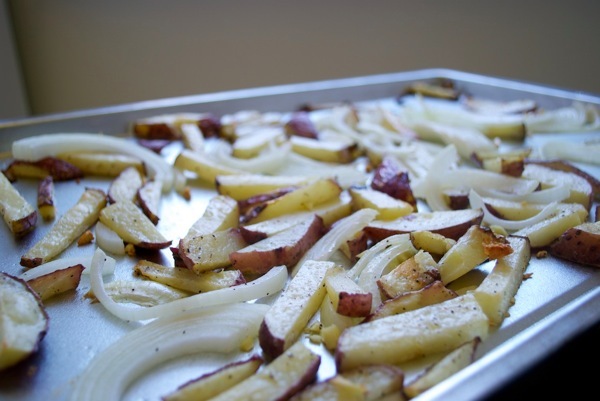 Coat a large baking pan with olive oil and place potatoes on the baking pan. Drizzle a couple tablespoons of olive oil on the potatoes and toss the potatoes so that the olive oil is distributed evenly. Once that is done, throw the baking pan into the oven, but don’t forget to sprinkle some salt and pepper onto the potatoes! Now let’s move on to the onions and garlic. 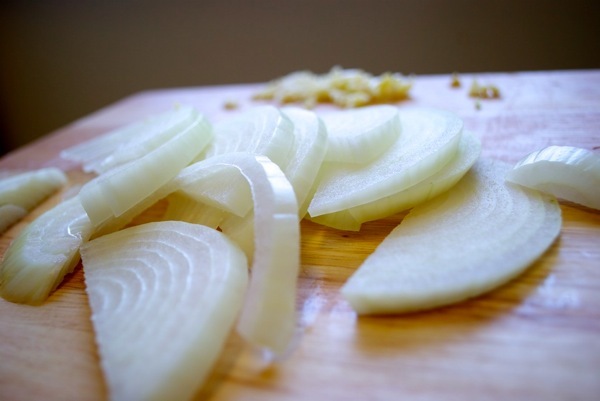 Halve the onion from top to bottom, then slice the onion into strips. If the onion was a globe and the roots were the south pole, you would cut from west to east or east to west. 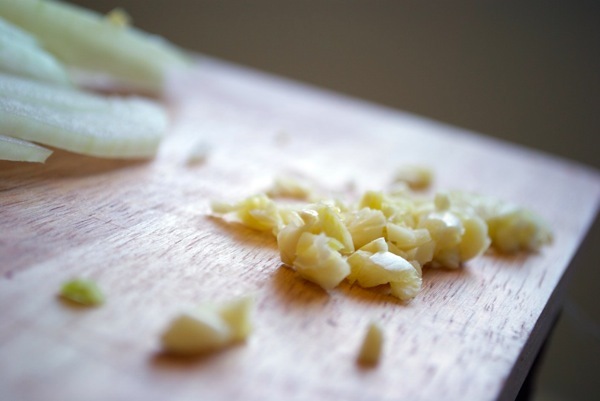 On the side, mince a couple cloves of garlic. Once ready, throw the onions and the garlic onto the baking pan with potatoes. 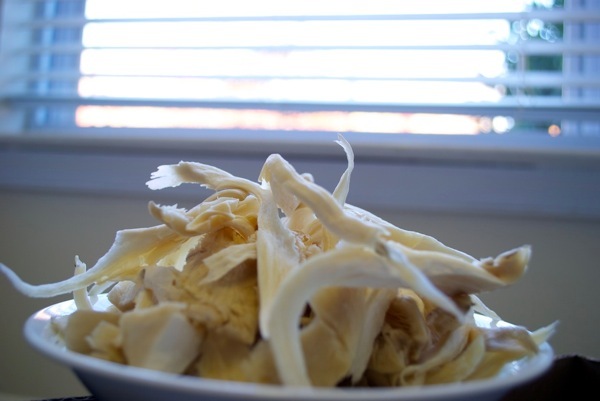 Afterwards, use your hands to tear the oyster mushroom into strips. Now get a second baking pan and follow the same procedures used to prep the potatoes earlier: coat the baking pan with olive oil, toss oyster mushrooms in more olive oil, and sprinkle—liberally—with salt and pepper. After about ten minutes, the oyster mushrooms should look like this. Since you put the potatoes in the oven earlier, they should have been cooking for more than ten minutes—about twenty minutes—and should look like this. 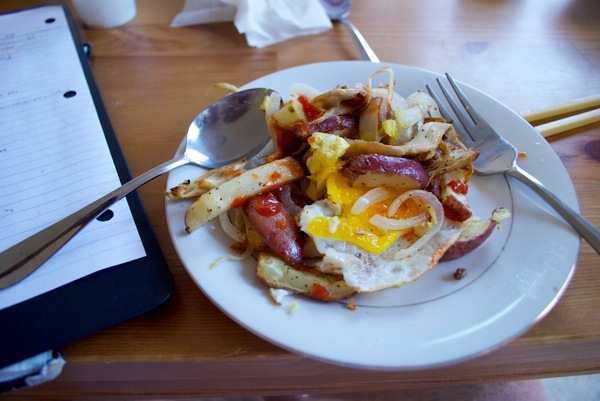 Now you simply mix the potatoes with the mushrooms, fry an egg, and plate the dish! Cut red potatoes into rectangular slices. 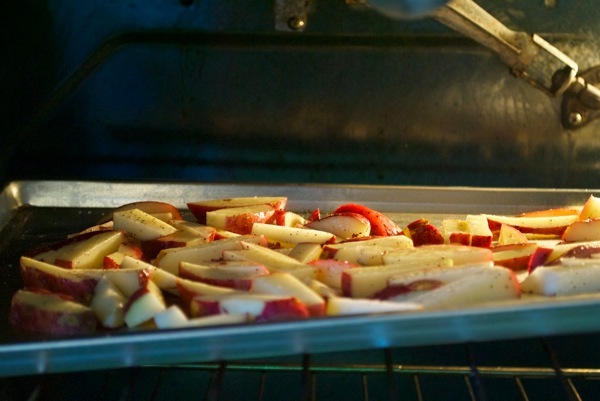 Coat a large baking pan with olive oil and place sliced potatoes onto the pan. Toss potatoes with a couple table spoons of olive oil and sprinkle with salt and pepper. Place baking pan in oven. Slice onion and mince garlic. Throw onions and garlic into the oven with the potatoes. 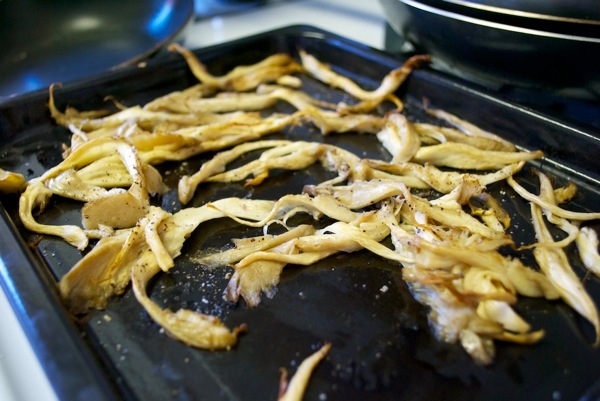 While the potatoes are roasting, tear oyster mushrooms into half-inch strips. Prep a second baking pan for the oyster mushroom by coating with olive oil. Place oyster mushrooms on second pan and toss with a tablespoon of olive oil. Sprinkle with salt and pepper. After the potatoes have been roasting for 10 minutes, put the second baking pan into the oven. Wait an additional 10-20 minutes until the potatoes are crisp and are browning in some areas. Fry eggs and place on a plate. After the aforementioned time has passed, take potatoes and mushroom baking pans out of the oven and mix together. Plate on top of the eggs.